This Series focuses on the power available to the church through the foolishness of preaching and teaching Christ crucified. Paul resolved to know nothing while he was with the Corinthians, but the powerful message of the cross. This message that has been revealed by the Spirit in all its deep wisdom and glorious truth.. When the life of the church is focused and centred around this message, the church is protected from all sorts of dangers, dangers that were far too obvious in the dysfunctional Corinthians. So to protect the health of the Corinthian church, Paul calls them (and by extension us) back to this message. The message of the cross protects us from division, leads us in holiness, empowers us for servant leadership and sends us out to offer this message to the world. Join us each week as we explore what it means for us to be a healthy church who only have One Exception. This summer in our all age series we are looking at the characters from the Old Testament mentioned in Hebrews Chapter 11. Hebrews 11 is all about faith and encouraging us to have faith in Jesus, even when our faith feels weak. To do that, Hebrews 11 imagines a great ‘cloud of witnesses’ from the Old Testament, gathered round cheering us on - like runners in a race with the crowd in the stands cheering the participants. The crowd in the stands cheering us are all 'heroes of faith' for us to follow, but these heroes are also all ordinary people like us. Ordinary people who make mistakes and mess up, yet have extraordinary faith. 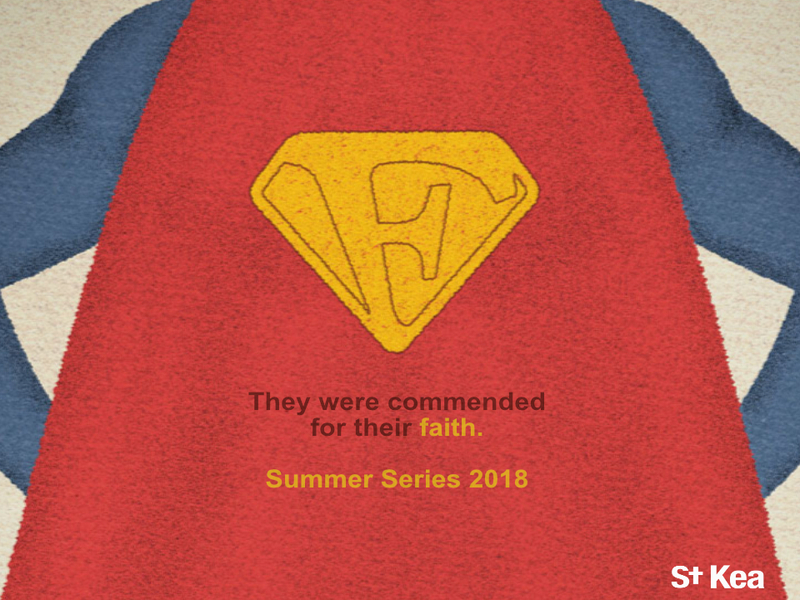 Each week we will be collecting another hero of faith for our collectors book. Can you collect them all? Launching this Sunday is a new sermon series in the book of Genesis helping us to experience the faithfulness of God. For many of us at different times we feel that life can be tough. Family life can be challenging, work life can be frustrating, struggles with illness or tensions in our relationships can (at times) make it seem like an uphill struggle. When we reach these 'low' places we can begin to wonder where God is, why He is not blessing our lives more, why God is not more like the God we see in the Bible? Abraham lived in this place. He had received amazing promises from God of being the head of a vast family - but the reality he saw in front of him was a childless marriage. How did he live in this place? How did he continue to trust God's promises? How did he know true joy? History this a three week series in the book of Genesis that will help us think about and know the promises of God for our lives. John writes about the life of Jesus with one very simple aim, that by coming to Jesus we might know true life - life in all it’s fullness. In our new sermon series 'Jesus' we will be exploring who Jesus is and what it really means to receive and live out the life he offers. No matter how many times you have read the Gospel of John and looked at the life and teaching of Jesus - he never fails to surprise us. Join us week by week as we discover how knowing Jesus as the Son of God changes everything about life lived now. It is particularly significant that we begin this new sermon series this week, as this week marked 500 years since a young German monk walked from his monastery to the Castle Church in Wittenberg and nailed a poster to the church door. On that poster were written 95 statements, challenging church teaching of the day. The monk was Martin Luther and that act has become associated with the start of the Protestant Reformation. This reformation impacted Christianity across Europe and beyond, gave birth to the Church of England and shapes our church to this day. In truth, the reformation was not any one single event in history. The Renaissance had led to a renewed interest in ‘ancient learning’ and fuelled a movement to get back to the Bible. Many were equally frustrated with corruption in the church. In Zurich in Switzerland Huldych Zwingli was introducing reforms based on his reading of the Bible. In England William Tyndall (despite church opposition) determined to translate the Bible into English so many could read it for themselves. Of course in school we are all taught the story of Henry VIII and his political and marital motivations to see change in the church. Yet Henry’s archbishop, Thomas Cranmer, was determined to see Protestant reform, and his Prayer Book (that we use to this day at Old Kea) wrote reformation theology into the weekly services of parish churches across England. … and much that shapes our life at St Kea is directly dependent on the discoveries that were being remade in those days. These imperfect and flawed people became instruments through which God displayed the glory of the gospel. Our hope is that we will constantly be reforming as a church, to better display that glory in our own day and age. This summer our all age series for our 9.30am St Kea Truro and 11.00am St Kea All Hallows congregations is taking us to the Psalms. (Old Kea continues as usual through the summer and the Tuesday CAP Lanterns congregation is now on summer break until 6th September). We are thinking about the different ways that God is described in the Psalms - our Shield, our Shepherd, our Redeemer, our Refuge, our Rock and our King. Each week we will be looking at a different Psalm and marvelling at the different characteristics of God. The services are shorter than usual, lasting about 45 minutes, and the whole service is designed for all ages.